Ardell Fashion lashes #102 are bold spiky lashes that give an edgy, yet glamorous look with alternating fine to thick spike designed. They are ideal for going out, attracting attention, and flirting. Comparable Bullseye KYLIE Lashes. For additional product details & how to apply information, please HERE. New Black/White Tray (Professional Natural Eyelashes) Packaging. 2. 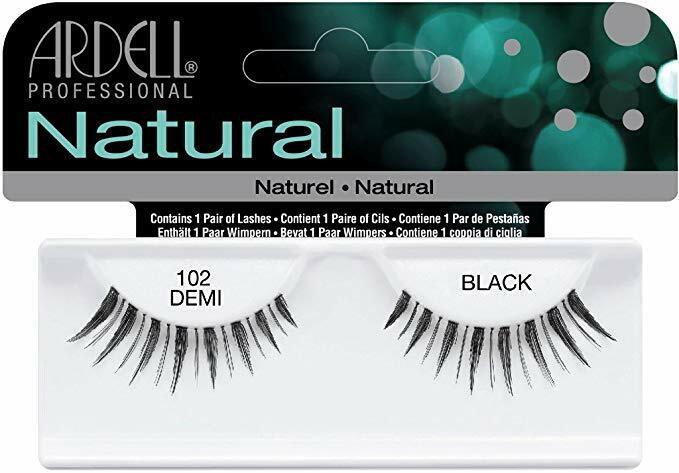 Align your #102 Demi Ardell false lashes gently to cover over your natural lashes and gently press them together. Make sure not to put mascara on your natural lash beforehand. I use these when I want to add a little length effect to my lashes. They look great ! use them with the duo adhesive and they stay on all day. I get a few uses out of these lashes and love how they look when I take pictures and what not. These are great for every day use. These lashes look so pretty, they give you a little bit of a dramatic look but not too much like others. You can reuse them and are comfortable to wear all day. Great for adding a bit of volume! As a dancer and fashion sucker they are absolutely necessary. I wear false lashes everytime I go out or perform. They really take every look up to the next level.